Direct comparison of the amounts of essential nutrients and ergosterol in wood provides evidence that the changes in the stoichiometry of decaying dead wood are driven by the action of fungi. They infest dead wood to take advantage of the ample supply of an energy-rich substrate. However, to exploit this resource, these fungi must import an array of essential nutrients from outside of the dead wood. This nutritional enrichment of dead wood creates a nutritional niche for xylophages that allows them to grow, develop, and reach maturity. Therefore, xylophagous beetles (considered as “wood-eaters”) are unable to gather the necessary amounts of nutrients from pure dead wood to grow and mature, but instead must utilize fungal tissues. Dead wood is rich in sugars and can serve as an energy source when digested, but it lacks other nutrients, preventing the growth, development and maturation of saproxylophages. Split into atoms sugars only serve as a source of carbon, hydrogen and oxygen, thereby providing insufficient nutrition for saproxylophages and for their digestive tract symbionts, despite the ability of certain symbionts to assimilate nitrogen directly from the air. 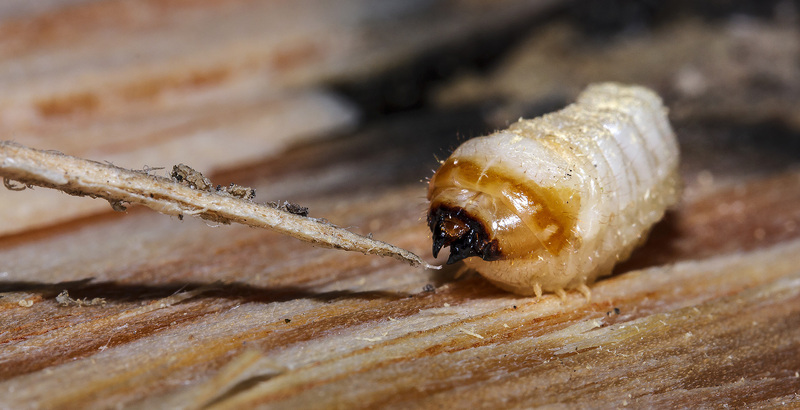 It’s commonly thought that it’s the symbionts that process the dead wood in order to provide sustenance for saproxylic organisms – but how do they do it if their food has so little nutritional value? The problem is related to the law of conservation of mass, which states that in order to produce a desired organic compound, the organism needs to possess all its ingredients (atoms of specific chemical elements). Dead wood consists of carbohydrates, lignin, and resins. They're all made up of carbon, hydrogen and oxygen. It’s not enough to sustain an organism, even if we take into account the fact that some symbionts can obtain nitrogen from air. Ecological stoichiometry framework was applied to understand how nutritional scarcity shapes saproxylophages-dead wood interactions. Dead wood is 1-3 orders of magnitude inadequate in biologically essential elements (N, P, K, Na, Mg, Zn and Cu), compared to requirements of its consumers, preventing the production of necessary organic compounds, thus limiting saproxylophages’ growth, development and maintenance. So where do saproxylic organisms get their sustenance from? The answer is fungi. The wood is nutritionally unstable. During decomposition, concentrations of the biologically essential elements increase, promoting saproxylophage development. Fungal transport of nutrients from outside of the dead wood system can shape nutrient dynamics early in wood decay, rearranging extremely scarce nutritional composition of dead wood environment during its initial stage of decomposition and assisting saproxylophage growth and development. During the first few years of decay, dead wood’s chemical composition is altered by fungi. They grow into the wood and are connected to the outside environment. From there, they can draw the chemical compounds the fungus lacks and introduce them into the wood. This is true both for organic and inorganic compounds: fungi can ‘digest’ rocks and ‘hunt’ organisms living in the soil. Larvae of saproxylophagous organisms bore into the fungus-filled wood, accumulating compounds that allow them to grow and develop. However, the process is still slow because of the low nutritional values of the fungus-wood mixture. This scarcity constrains beetle development to some degree, which may be overcome through prolonged larval development time, as observed in nature. This is also aided by the relatively low mortality rate for xylophages living inside dead wood. Thus, fungi allow xylophages to develop, and xylophages in turn affect dead wood, contributing to wood decomposition and nutrient cycling in the forest floor. Filipiak, Michał, Sobczyk, Łukasz; Weiner, January Fungal Transformation of Tree Stumps into a Suitable Resource for Xylophagous Beetles via Changes in Elemental Ratios. Insects 2016, 7, 13, 10.3390/insects7020013.